Blizzard » Flying in Draenor, it’s Coming. Really. First off, note that this is coming to the test realm, as of this writing, so all of this info may change before it goes live. In an upcoming Public Test Realm build, we will be introducing a new meta-achievement called Draenor Pathfinder. You’ll earn this achievement in Patch 6.2 by mastering the outdoor environment of Draenor—exploring Draenor’s zones, collecting 100 treasures in Draenor, completing the Draenor Loremaster and Securing Draenor achievements, and raising the three new Tanaan Jungle reputations to Revered. Initially, this achievement will award a rylak mount: the Soaring Skyterror, one of the native beasts that roam Draenor’s skies. Players will remain ground-bound on Draenor until a small follow-up patch (6.2.x), when all players who have earned Draenor Pathfinder on at least one character will unlock the ability to fly in Draenor on all of their level 90+ characters. Progress check? 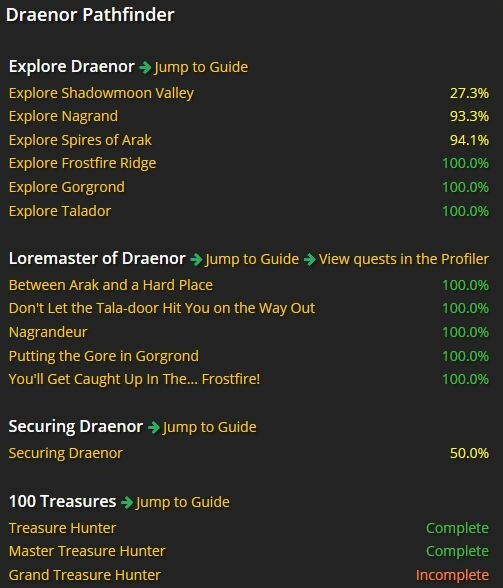 You can always check the achievements pane in-game, but an easier way to check your progress is with WoWhead’s flying tool. This is my Rogue’s progress as of this writing. Have a level 3 Garrison and enough resources to access Tanaan. The resources aren’t a problem, but having the level 3 garrison means you’ll be level 100. The resources will be needed for your shipyard and such. Explore all of the Draenor zones, you will get an achievement for each of these. Note that the achievement listed in the tool, for the treasures, is the one requiring 200 treasures, while the Bliz post and the WoWhead guide both say 100. HandyNotes (from Curse) will mark the treasures for you on your maps. I have 83 treasures found as of this writing. Guess I’ll get back to work. Complete the Loremaster achievement, which means doing pretty much all of the quests in all of the zones. Zygor can help you with that one, as well as the treasures. (By the way – there are loremaster achievements for the earlier zones, as well. ) Be happy, you’ll pick up some followers along the way and make a pretty fair amount of gold. Securing Draenor – According to the achievement description (securing Draenor) you have to do all 12 Apexis dailies, once each. They’re a grind and some people hate them. Just collecting a ton of Apexis crystals won’t be enough, you do have to do the quests. Make friends. The new zone, coming in 6.2, is Tanaan. As you probably know this is the zone where you entered Draenor and subsequently escaped from masses of psychotically murderous Orcs. You’ll need to run enough quests/errands for the locals there to gain a Revered reputation with at least three of those groups. Flying won’t actually be launched with patch 6.2, as noted in the quote above, but a bit later. Now, if you got to level 100 through PvP or dungeons or otherwise avoided all of the quests and the various zones then you’ll have some work to do. Before it’s launched you can get the Exploration and Loremaster achievements for all the other zones, get 100 treasures, and get geared as well as you can. If you’re on a PvP server it might be worth considering doing the Tanaan part with that guild group. And she does the “Happy Penguin Dance” at about 6:20.